Myanmar's former first lady Su Su Lwin (L), State Counselor Aung San Suu Kyi (C), and Khan Thet Htay (R), wife of Vice President Myint Swe converse after an International Women's Day ceremony in Myanmar's capital Naypyidaw, Feb. 8, 2018.
International Women’s Day was celebrated throughout Southeast Asia on Friday with peaceful processions calling for equal opportunities for all women and personal appeals for greater female involvement in politics in the traditionally conservative, male-dominated region. While women in Myanmar, which is led by a prominent female leader, Aung San Suu Kyi, lamented their low representation in positions of power and the suffering of refugees from the country’s civil wars, activists in Cambodia were prevented from marching on Friday. In Vietnam, NGOs called attention to jailed women bloggers and journalists. International Women's Day is celebrated annually on March 8 to commemorate the movement for women's rights. Women, who comprise more than half of Myanmar’s population, occupy only 11.3 percent of the 433 seats in the lower house of parliament, and 12 percent of 224 seats in the upper house in the country led by State Counselor Aung San Suu Kyi, the most visible female leader in Myanmar who also serves as foreign affairs minister. Mya Lay Sein, deputy minister for health and sports, is the only woman in a top ministerial-level position, while at the regional level, two women serve as chief ministers, five as ethnic ministers, another five as township administrators, and 84 as village administrators. “Myanmar women are not encouraged to participate in the positions that can make important decisions,” said Thinzar Shunlei Yi, an advocacy coordinator with the NGO coalition Action Committee for Democracy Development. Ma Thida, a human rights activist, surgeon, writer, and former prisoner of conscience agreed. “Becuase our society is weak in supporting women to become leaders, to accept as leaders, to respect women leaders, [women] can’t show their qualifications even if they reach higher level positions,” said the first elected president of PEN Myanmar who now serves as a board member of PEN International, a global organization that promotes freedom for writers. “If women can work more in the administrative, judicial, and legislative sectors, there will be more balance in these sectors,” said Yangon-based political commentator Yan Myo Thein. Myanmar Vice President Henry Van Thio pledged that the government would ensure that women comprise 30 percent of the participants in every sector during an event marking International Women’s Day in Naypyidaw, the state-run Global New Light of Myanmar reported. The government's current national strategic plan that runs to 2022 is pushing for the advancement of women in the areas of livelihoods, education, health, and human rights, among others, the newspaper said. As part of the plan, the government has created task forces to prevent violence against women and girls, to help them participate in politics and business, to promote gender equality in all sectors, and to ensure peace and security for women, it said. Many ordinary women in Myanmar, especially those in rural areas with limited educational opportunities, face gender discrimination in both the workplace and society at large along with possible abuse by partners or by soldiers in areas of armed conflict. The obstacles for these women are made even more difficult to surmount by a culture and tradition that hold that women are inferior to men and should be relegated to being housewives and raising children. While women called for equal opportunities and gender balance at a public event marking International Women’s Day in Yangon, Myanmar’s commercial capital, others from some of the country’s war-torn ethnic regions underscored the physical dangers that women and children face in these areas. Khun Jar, a leader of the Kachin Peace Network, a Yangon-based humanitarian organization that assists civilians displaced by conflict in northern Myanmar, told RFA’s Myanmar Service that her group is working on a case in which a 13-year-old girl “was sold to China” on Thursday. More than 107,000 civilians, including women and children, have been displaced in Kachin and neighboring northern Shan state during the past seven years by fighting between the Myanmar Army and ethnic armed groups or between different ethnic armies. Human traffickers are known to operate in the border regions, such as that of Muse in Shan state, recruiting women as brides and birth surrogates for Chinese men through advertisements posted on the streets. A day earlier in Washington, U.S. first lady Melania Trump and Secretary of State Mike Pompeo saluted 10 woman from around the world, including one from Myanmar and a Rohingya from Bangladesh, as recipients of the prestigious International Women of Courage Award. Razia Sultana, a Bangladeshi Rohingya lawyer was honored in Washington for her “fearless efforts” to defend the Rohingya community in Myanmar by advocating for human rights for the Muslim refugees and documenting systematic sexual violence against women and girls. Thousands of Rohingya women and girls suffered sexual assaults at the hands of Myanmar military forces during a brutal crackdown in northern Rakhine state in 2017 that caused more than 730,000 members of the stateless and persecuted minority group to flee their homes and seek shelter in neighboring Bangladesh. Now living in sprawling displacement camps in southeastern Bangladesh, female Rohingya refugees are subject to sexual assaults by Rohingya men. “[In] 2017, the world watched in horror as the Burmese army unleashed unspeakable crime, and this time against the Rohingya women, said Myanmar activist Naw K’nyaw Paw, who was also honored at the event for her lifelong work condemning the military-led violence against the Rohingya and helping to improve the lives of women and children in conflict-affected communities. “Thousands of rapes have been documented from one ethnic nationality to another, and still these men run the country and control the lives of our people,” she said during a speech at the Washington ceremony. 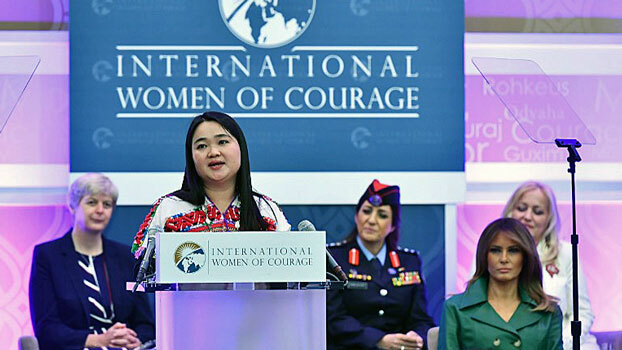 Naw K’nyaw Paw, a rights worker with the Karen Women’s Organization (KWO) who herself was born in a displaced persons camp after government soldiers destroyed more than 3,500 villages and killed thousands of people in southeastern Myanmar’s Kayin state, said that many other women in other ethnic areas continue to suffer at the hands of the army. The KWO, which has more than 60,000 members in refugee camps in Thailand, in internally displaced persons camps in Kayin state, and in villages across southeastern Myanmar, has documented the military’s abuse of Karen women in various reports. “We need the world to act as a united community to implement target sanctions against the military and to have a body outside Burma to [deliver] justice and to hold generals accountable for these extreme human right violations,” Naw K’nyaw Paw said. On International Women’s Day in neighboring Laos, women called for the government to improve heir basic living conditions and educational opportunities. A teacher from Savannakhet province told RFA's Lao Service that she wants the government to raise the salaries of low-paid teachers, who sometimes go months without receiving their wages due to local government budget shortfalls. She also asked that officials consider giving teachers who must travel far from their homes to work places to live that are closer to their schools, and to ensure that schools have electricity and toilets. A woman from Khammouane province in the central part of the country said she also wants the government to create more job opportunities for women, especially since most factories tend to hire more men than women. Another woman from Khammouane Province said she wants the Lao Women’s Union Federation, which implements policies and laws related to the rights of women and children, women’s advancement, and gender equality, to find grants that will pay for women to study and set up businesses to support their families. “But so far nothing has happened,” she said. 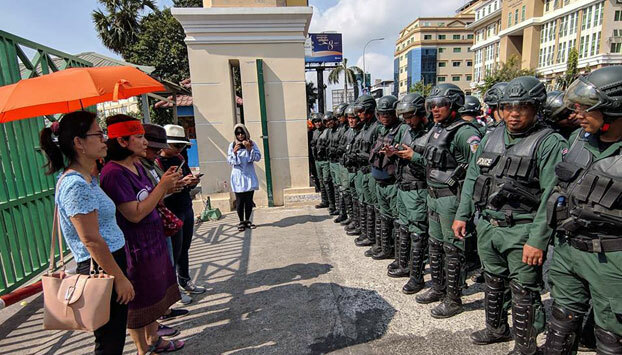 In Cambodia, authorities restricted women rights activists from marching to the Council of Ministers building in Phnom Penh to deliver petitions outlining several demands for improving their safety and work conditions. Rights activists, workers, union leaders, and NGO workers who participated in the demonstration were confined to the Olympic Stadium to prevent them from delivering their petitions. More than 100 security personnel, including police, were deployed to block the women as they tried to leave the stadium. Authorities said they didn’t allow the march to the Council of Ministers office because they were afraid the event would cause traffic chaos and social disorder. Chak Sopheap, the executive director of the Cambodian Center for Human Rights (CCHR) who attended the event, said Cambodians must not be denied their rights to freedom of assembly and expression. She also said that women should be encouraged and empowered so that they can fully and actively engage in all aspects of life. Later in the day on Friday, Phnom Penh spokesman Meas Chanyada agreed to receive the petition and said he would submit it to the relevant state institutions by March 13. In the document, the women called on the government to create community kindergartens and daycare centers at workplaces, build safe shelters for women and domestic workers who are victims of domestic violence, take measures to end sexual violence against women in the workplace and against female right activists, and prevent the exploitation, human trafficking, and modern-day slavery of migrant workers. Land rights activists and victims of land grabs were not allowed to celebrate International Women’s Day events in five Cambodian provinces, including Tbong Khmum and Kampong Speu. Am Sam Ath, a senior investigator for the domestic rights group Licadho, said that people’s rights to assembly in Cambodia remain restricted. Also on International Women's Day, New York-based media watchdog the Committee to Protect Journalists (CPJ) highlighted cases of female journalists jailed around the world in retaliation for their work, including those of Tran Thi Nga and Huynh Thuc Vy. The two women are serving sentences in Vietnam for their reporting on human rights abuses and corruption, CPJ said. Nga, who writes under the pen name Thuy Nga, is serving a nine-year sentence for spreading “propaganda against the state” after writing about abuses by authorities, including trafficking, the confiscation of land, and police brutality. At her one-day trial in July 2017, prosecutors presented as evidence videos she made on a massive fish kill caused by water pollution from toxic industrial waste discharged by a steel plant, territorial disputes with China, and state corruption, which were in violation of the law. Can Thi Theu, a female rights activist jailed for 20 months for public disorder charges for protesting government-sanctioned evictions used to clear the way for commercial development, said Nga is not faring well in prison. Vy, an independent blogger since 2008 and human rights advocate who frequently writes on political, environmental, and social issues, including the country's political prisoners,was placed under house arrest in August 2018 in central Vietnam's Dak Lak province. Police confiscated computers, books, and other materials from her home as part of their investigation into her reporting activities, CPJ said. More than three months later was was sentenced to two years and nine months in prison for defacing the Vietnamese flag, a criminal anti-state offense under Article 276 of the country's Penal Code. The court ruled she would be held under house arrest until her children reached three years of age at which time she would have to begin serving her jail sentence. Vy said she did not file an appeal of her case because she knew that officials in Dak Lak province would force her to leave the country. Reported by Zarni Htun for RFA’s Myanmar Service and by the Lao, Khmer, and Vietnamese services. Translated by Khet Mar, Sidney Khotpanya, Nareth Muong, and Gia Minh. Written in English by Roseanne Gerin.